Mickey Charteris has been diving for over 20 years, most of that time professionally, either as an Instructor, Divemaster or underwater videographer. His early video work was featured on The Discovery Channel and he produced a documentary on coral reef ecology, also titled Caribbean Reef Life. This documentary is now sold to help the local charities of his home island of Roatan. One day Mickey first borrowed a friend's still camera, and he was hooked. 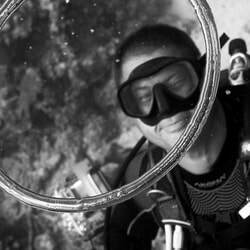 He began shooting a "species library" of the local reef inhabitants. He jokingly vowed that when he had collected 1000 species photos, he would publish a book. In late 2011 he hit his mark, and began assembling and organizing his photos into the work that would eventually become "Caribbean Reef Life". The species count is just over 1500 and growing. The book is now going into it's fifth printing, as an expanded third edition. Mickey is still seeing new things on every dive. Mickey Charteris was born in Canada, and almost grew up in South Africa. He has been diving in over two dozen locations around the world, but his real love is the coral reef surrounding the island of Roatan, the largest of the Bay Islands of Honduras. Roatan is an ideal place for a photographer in the Caribbean because of the amazing diversity of it's reefs. Practically all species of Caribbean corals and sponges can be found just a stone's throw from the shore. And almost all of the major Caribbean fish species can be found here, too. It's just far enough from the mainland of Central America not to be affected by pollution or run-off, and the deep waters of the Cayman Trench are found just off the reef. It is swept by two major currents, both east and west, at different times of the year, allowing the full range of the Caribbean's marine diversity to find a home in it's coral reefs. While most of the photographs were taken in the Bay Islands of Honduras, the book is just as useful throughout the rest of the region. Endemic and iconic species that are common elsewhere in the Caribbean have now also been included, along with their ranges. Over a dozen guest photographers have contributed species images to make the identifications as widespread as possible. Mickey shoots all his photos using Canon G-series cameras. follow mickey's blog "caribbean reef life"